The CL600 mechanical panic device access kit is a coded front plate only with extra long spindle to work with most single point panic pads. Please note panic hardware not included. The CL600 range incorporates the new Quick Code system which allows on door code change in seconds. Typically most mechanical digital locks require the lock to be removed from the door or partly disassembled to change the code. Use on internal doors and external doors. Quick Code change - no need to remove lock from door. Lever handle lock for doors hung on the left or right. Use in offices / schools / warehouses / hospitals / care homes / nurseries / hotels / leisure facilities / the home. Tested to Grade 2 - ANSI - A156.2. Keypad with an extra long spindle to work with most exit devices with 8mm square followers. 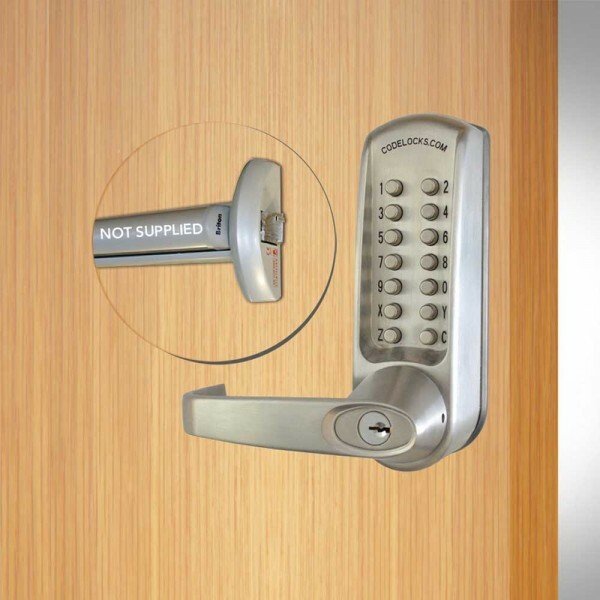 As standard the lock has a key override function.